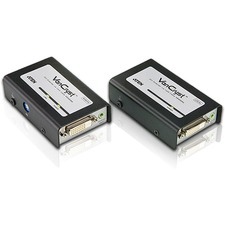 The B140-1A0 is a receiver unit that is used with the B140-002 and B140-004 extender/splitter transmitter units, and it transmits a DVI-D Single-Link signal up to 200 ft. away using a single Cat5e/6 patch cable. To achieve maximum distance and resolution, use 24AWG Solid Wire Cat5e/6 cable (Tripp Lite's N202-Series). 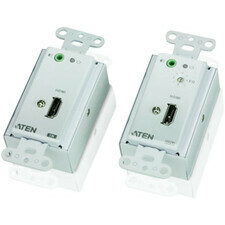 The B140-1A0 is compatible with all operating systems, and is plug and play, with no software or drivers required. 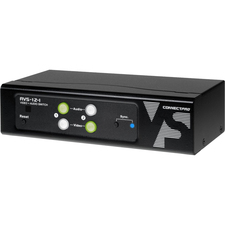 It features a built-in Equalization control for adjustment of the video image. Compliant with the Federal Trade Agreements Act (TAA) for GSA Schedule purchases.Installation is simple. 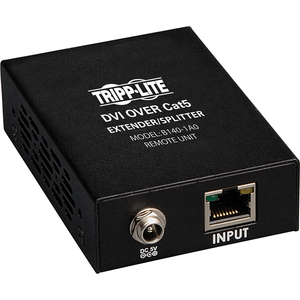 Connect a B140-002 or B140-004 transmitter (not included) to a DVI source using a Tripp Lite P561-Series DVI cable (not included). Connect the B140-1A0 to a display using a Tripp Lite P561-Series DVI cable (not included). Finally, the receiver unit is connected to an RJ45 port on the transmitter unit using a single Cat5e/6 cable. 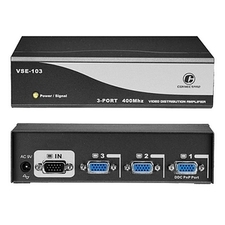 A 1920 x 1080 @ 60Hz signal can be extended up to 150 ft. from the source,, or a 1024 x 768 @ 60Hz signal up to 200 ft..Further expand the range and number of monitors by using a B140-110 repeater unit. 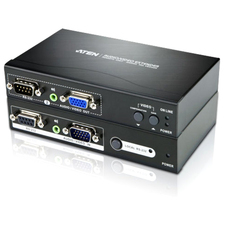 Add up to four remote units (three repeaters and one active receiver) to each channel of the B140-002 or B140-004, for a total of 4 displays per channel. (An active receiver should be the last unit in a channel) A 1920 x 1080 @ 60Hz signal can be extended up to 125 ft. from each repeater to the next unit in the channel, or a 1024 x 768 @ 60Hz signal can be extended up to 175 ft..